Indicated for the treatment of pneumonia and shipping fever in cattle and sheep, erysipelas in swine, and strangles in horses. 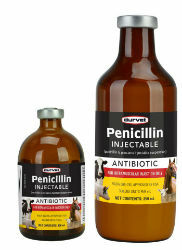 Each ml of Penicillin Injectable contains 300,000 units of Penicillin G Procaine. Penicillin G Procaine has long been regarded as one of the premier antibiotics available. It diffuses rapidly throughout the entire body providing quick therapeutic blood levels. While extremely toxic to bacteria, Penicillin G Procaine is relatively non-toxic to animals, making this the drug of choice for treating infections and diseases. Broad spectrum activity, Fast acting, quickly reaches therapeutic blood levels. Economical and effective. 48-hour milk out. Dosage is one ml per 100 lbs. bodyweight.